Improve your academic skills by attending workshops, drop-in hours or individual appointments. Please visit the ASC web site for more information. 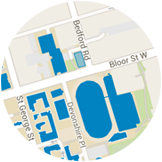 Registered UofT students paying compulsory athletic incidental fees are automatically members of the Athletic Centre, Hart House and the Varsity Centre (conveniently located across the street from the FIFSW). This includes part-time and full-time undergraduate and graduate students. The Graduate Students’ Union offers a number of SGS Intramurals and Leagues. Visit the University of Toronto Graduate Students’ Union web site for further details. The Computer Lab and printer, Room 724 is available to all Students. The faculty also has wireless access. The Computer Lab is normally open from 8:30 AM. to 4:45 PM, Monday to Friday. If the door is locked, please check with the General Office, Room 250. Access to the lab after 5:00 PM and during weekends is available by obtaining an Access Card from the General Office. A deposit of $30 is required to get a card to the building and a code to the lab. There are a limited number of Access Cards available on a first come, first served basis. The card is valid until you graduate from the program. Kindly report any problem to the General Office (416) 978-6314, stating the nature of the problem and giving the asset number (found on the red and white sticker) of the machine. Students require a User ID and Password to use the computers in the lab. This information is available in the General Office, Room 250 from the first day of class each Fall term. You may activate your print account by cash payment in the General Office. Printing is charged on a per-page basis: $40 for 300 pages and $65 for 500 pages (effective May 1, 2015). There are no refunds for unused pages/balance. Your print account will remain active until you graduate. Each year, User IDs and Passwords will be revised. Returning students will have their print balance transferred to their new account. A joint partnership of SGS, Student Life and the Graduate Students’ Union (GSU). The CRC is a resource for members of the graduate community for best practices in conflict resolution and dispute prevention, including a grad-to-grad peer support team (G2G Peer Advisors). The G2G provide informal and confidential advice to their peers on any academic matters to help them navigate conflict early and more effectively – no issue is too small to discuss. Health and Wellness Centre located in the Koffler Student Services Centre, 2nd floor 214 College St., offers a number of services including mental wellness. For copies of course outlines, bibliographies, practicum evaluations, etc. see if the course instructor(s) has a copy. A charge will be levied to provide copies of course materials that are requested after graduation. Contact the General Office (416) 978-6314 for details. Should you wish to review material held in your student docket, see the Registrar, Room 252. Letters of reference which were part of the Admission Process are not available for review. Student assignments should be handed in at the General Office, Room 250. Assignments will be date-stamped and distributed several times daily to the Faculty mailboxes. Be sure to staple your paper together (not paper-clipped) with your name, the instructor’s name and course number clearly marked on the front page. Your papers will be treated with a high degree of regard but administrative staff cannot be held responsible for them. Students are advised to make a copy of their assignments before handing them in to the General Office. Staff in the General Office are not able to hand back assignments to students. Assignments will be returned to you by the instructor. If you wish to have assignments mailed to you after the end of the academic session, you must leave large, stamped, self-addressed envelopes with the instructor. Written examinations, including take-home examinations, are not returned to students but are retained in the Factor-Inwentash Faculty of Social Work for one year. Visit the University of Toronto Graduate Students’ Union web site for more information. Committee membership is comprised of administrative staff and faculty at the FIFSW. Please report any concerns to the General Office, Room 250. Catering ingredients: Caterers are required to provide a list of ingredients for food being served at Faculty events and meetings. Door Security: Front and back doors are locked after business hours. Instructors of evening and weekend courses are asked to inform their students not to prop doors open at mid-class breaks unless someone can be designated to ensure the door(s) are securely locked after all students have returned. Emergency Blue Lights: Emergency help buttons (Blue Code) are located at all exit stairwells in the building. Scent-free zone: FIFSW is a scent/fragrance-free building so as not to adversely affect those who might have allergies and other related health problems. Located on the 2nd floor of the Factor-Inwentash Faculty of Social Work Building in Room 252 (within the General Office, Room 250). Contact (416) 978-6364 for registrarial services and funding inquiries. Located on the main floor of the Koffler Student Services Centre at 214 College Street (on the North West corner of St. George Street and College Street). The Health Sciences Writing Centre (HSWC) offers individual writing instruction and support to MSW and PhD students in the Factor-Inwentash Faculty of Social Work. You may bring in writing assignments at any stage, and we will help you develop your capacity to plan, research, organize, write and revise your papers and theses. Visit our web site at http://www.hswriting.ca/ to book an appointment online. We are located in Room 344 (FIFSW). Social Work students may also make use of the roster of appointments in our offices in the Faculty of Nursing and the Athletic Centre. A full schedule of appointments and maps describing our locations are posted on the web site. The HSWC is a busy site, so it is advisable to book at least two weeks in advance.